The International Union of Microbiological Societies will hold its three International Congresses concurrently (XIVth International Congress of Bacteriology and Applied Microbiology, XIVth International Congress of Mycology and Eukaryotic Microbiology, XVIth International Congress of Virology) so as to favour cross-fertilization among disciplines and hence foster a modern outlook on microbiology in the 21st century. Authors are invited to submit an abstract in English to be considered for an oral or poster presentation at the Congresses. Authors are asked to submit abstracts using the on-line abstract submission link. 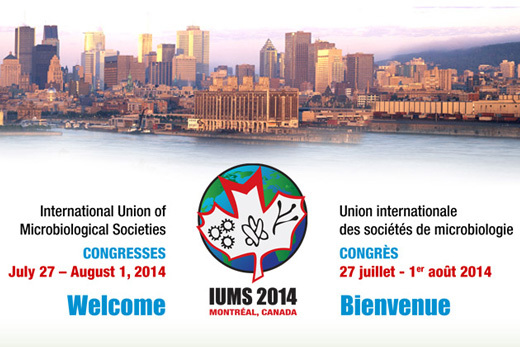 See the impressive list of confirmed invited speakers: www.montrealiums2014.org/documents/IUMS2014Poster16p.pdf. You can register for the Congresses at www.montrealiums2014.org/side_registration/secure_online_registration_e.shtml through a secure site. Summer is a peak tourist period in Montréal. Reserve your accommodation soon.